Martin Energy Services LLC, State Crowley Maritime Corporation’s Harbors and Silver Bay, Minnesota, and Local Agencies and GCSG. The liner services group announced in Jan- and Marquette, Michigan, totaled cool-down process took approximate- uary that it will add a 400 FEU capac- 5,124,525 tons, an increase of 41.8 ly 12 hours to achieve the desired tank ity, ? at deck barge to its South Atlantic percent compared to December 2013. temperature and pressure utilizing Puerto Rico service in the ? rst quar- January 2015 was not as cooperative, 3,800 gallons of nitrogen. The LNG ter, increasing the rotation between ice and weather-wise. A number of bunkering was successfully completed Jacksonville, Fla., and San Juan to delays were incurred and cargo totals, within a few hours of cool-down. The four sailings each week. The company when ? nalized, will re? ect that. Crowley Maritime Corporation’s San Juan, increasing capacity by over ed States Army Corps of Engineers 2014 Thomas B. Crowley Sr. Me- 40 percent. 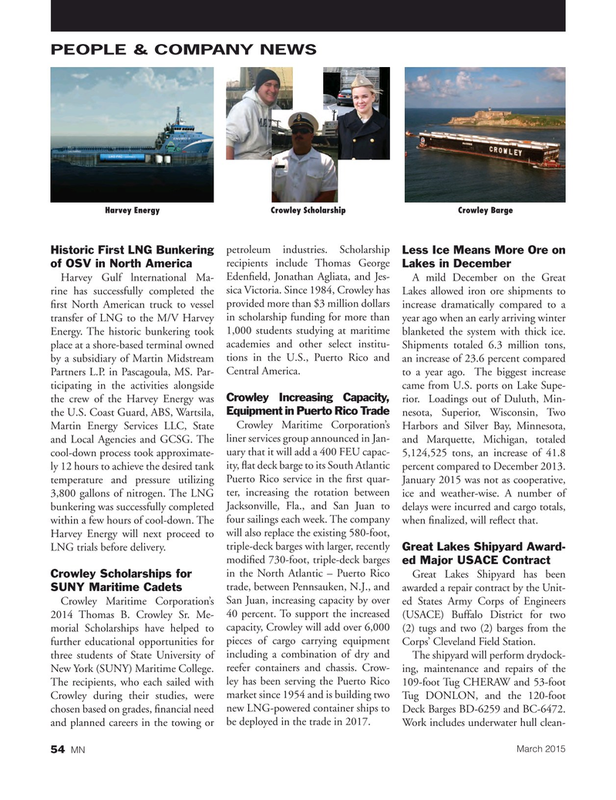 To support the increased (USACE) Buffalo District for two morial Scholarships have helped to capacity, Crowley will add over 6,000 (2) tugs and two (2) barges from the further educational opportunities for pieces of cargo carrying equipment Corps’ Cleveland Field Station.